Regular readers already know that I don't have very high hopes for Windows 8 or the PC industry as a whole. On the eve of the Windows 8 launch, let's take a look at some pre-launch metrics to gauge the market's likely response. My previous post on the impact of mobile devices on the PC replacement cycle showed that longer replacement cycles have caused PC sales to slump. This trend continued in Q3 with PC shipments declining by over 8% YoY. While PC sales normally decline before the launch of a new operating system, the replacement cycle shows that this is a long-term trend and not temporary. More importantly, we know that chip demand is a leading indicator of PC demand in following quarters. If PC makers expected Windows 8 to increase PC demand in Q4, we would see an uptick in manufacturing activity starting in Q3. Instead, we saw poor performance from leading x86 chip manufacturers like Intel & AMD, which means that Q4 PC demand will remain low. Intel CEO Paul Otellini said he expected PC growth to be about half of expectations based on normal seasonality. Based on these market inputs, it is fairly safe to say that Windows 8 demand will be muted on launch. Even Microsoft declined to say much about Windows 8 expectations during their earnings call, which hints at poor Windows 8 performance. 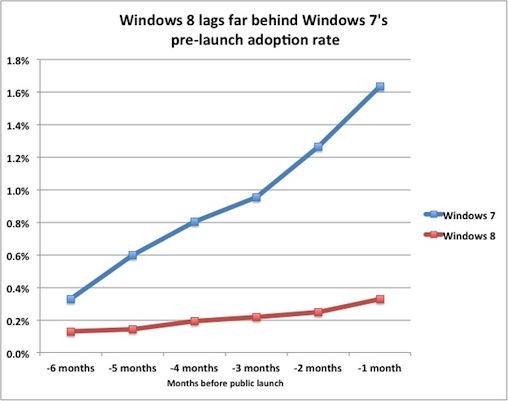 Data from Net Applications has shown that pre-launch adoption for Windows 8 has lagged far behind that for Windows 7. One month before the launch of Windows 7, 1.64% of all PCs ran the operating system as compared to just 0.33% for Windows 8. The interesting part is that pre-launch adoption figures would mostly be driven by tech enthusiasts as opposed to mainstream consumers. Given the drastic change in the user interface, enthusiasts would most likely adopt Windows 8 more willingly than the broader market, which implies that consumer demand for Windows 8 (independent of PC market vulnerability) should be incredibly weak. This leads me to the conclusion that after the initial enthusiast driven purchases, the PC market & Windows 8 demand crash. Forrester Research carries out a survey before the launch of every new Windows version to gauge the upgrade interest of enterprise consumers. 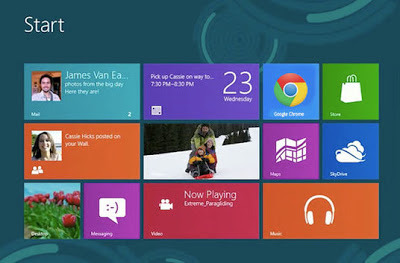 Their findings show half as many companies plan to adopt Windows 8 as compared to Windows 7. The incredibly large proportion of companies that have not yet considered Windows 8 can be explained by the fact that many have just completed their migration to Windows 7. Making a large investment for another upgrade doesn't make much sense, especially considering the additional training costs required for Windows 8. 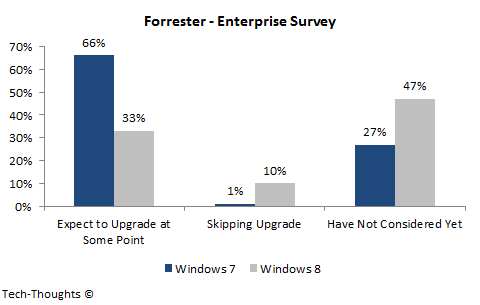 Based on this, enterprise demand for Windows 8 should be very low. The first three metrics above measured Windows 8 demand in the PC segment. Now let's take a look at the demand in the tablet segment. Demand for a platform in the mobile segment is primarily driven by app selection and consumer awareness. As Microsoft found out with Windows Phone, entering a market late doesn't really help with either. Let's first take a look at the Windows 8 app situation. 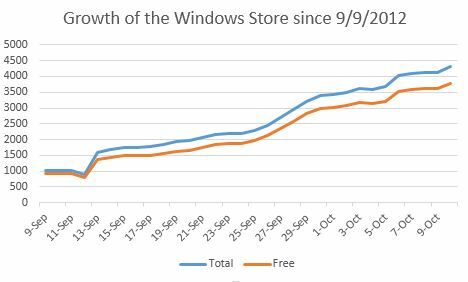 Winappupdate, which has been tracking the growth in Windows 8 apps, says that there should be over 5,000 apps available by launch day. This is far less than the number of apps available on major competing platforms. Microsoft is banking on PC sales to spur app development, which in turn would drive tablet sales. Unfortunately, as I've already shown, that's a flawed strategy as usage of touch-optimized applications on non-touch devices has never been high. In addition to this, high prices should ensure that Windows 8 tablet demand remains weak. Finally, we come to consumer awareness. I have already highlighted that Microsoft has not made any efforts to educate consumers about the differences between Windows RT and Windows 8, and seem to be banking on salespeople to do so. Strangely, Microsoft's own salespeople seem to be unaware of the differences between the two. This gap should create huge point of sale challenges for Windows RT based tablets and could create a problem with product returns. Confused consumers would most likely end up buying competing products that exhibit clear value propositions. Conclusion - These pre-launch metrics clearly show that the Windows 8 platform should see very poor demand in the market, for both PCs and tablets. With mobile devices overtaking PCs, the repercussions for Microsoft should be far more severe as compared to the Windows Vista fiasco.